If anyone considers and examines these things, there is no need of a lengthy discussion and arguments. Proof for faith is easy in a brief statement of the truth. 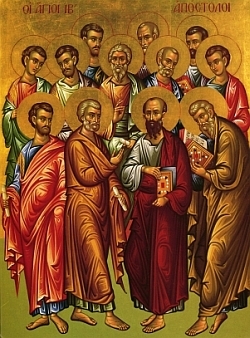 Upon him, being one, He builds His Church, and although after His resurrection He bestows equal power upon all the Apostles, and says: ‘As the Father has sent me, I also send you. Receive the Holy Spirit: if you forgive the sins of anyone, they will be forgiven him; if you retain the sins of anyone, they will be retained,’ (John 20:21-23) yet that He might display unity, He established by His authority the origin of the same unity as beginning from one. 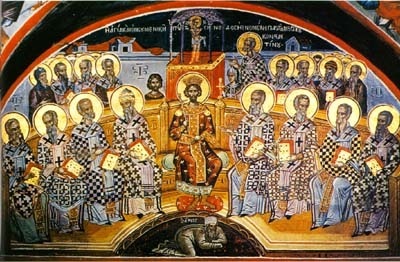 Surely the rest of the Apostles also were that which Peter was, endowed with an equal partnership of office and of power, but the beginning proceeds from unity, that the Church of Christ may be shown to be one. This unity we ought to hold firmly and defend, especially we bishops who watch over the Church, that we may prove that also the episcopate itself is one and undivided. Let no one deceive the brotherhood by lying; let no one corrupt the faith by a perfidious prevarication of the truth. The episcopate is one, the parts of which are held together by the individual bishops. The Church is one which with increasing fecundity extend far and wide into the multitude, just as the rays of the sun are many but the light is one, and the branches of the tree are many but the strength is one founded in its tenacious root, and, when many streams flow from one source, although a multiplicity of waters seems to have been diffused from the abundance of the overflowing supply nevertheless unity is preserved in their origin. Take away a ray of light from the body of the sun, its unity does not take on any division of its light; break a branch from a tree, the branch thus broken will not be able to bud; cut off a stream from its source, the stream thus cut off dries up. 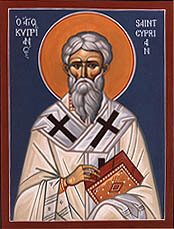 Thus, according to St. Cyprian, the unity of the Church is expressed by a single episcopate (the collective body of all Bishops of the Church, represented by St. Peter) even though there are many Bishops (heirs of the Apostles) in different locations. For a brief commentary on this passage, see His Broken Body by Fr. Laurent Cleenewerck, pp 81-83. This post greatly expands on a similar posting from earlier. This entry was posted on Sunday, April 22nd, 2012 at 3:00 pm and is filed under Uncategorized. You can follow any responses to this entry through the RSS 2.0 feed. You can leave a response, or trackback from your own site. Can East & West Coexist With Married Priests? Eastern "Blind Spot" or "Cross-Pollination"? Were Watchtower Prophecies About 1914 Fulfilled? Can East and West Coexist With Married Priests? PARROQUIA ORTODOXA SAN JUAN EVANGELISTA – "EL TEÓLOGO"
Do The Old Testament Saints Receive a Heavenly Reward? Earthquakes — Sign of the Last Days? Jehovah's Witnesses – Do You Know the Truth? Jesus of Nazareth – Who is He? Response to "What Does the Bible Really Teach?" Some Bible Beliefs Have To Be Wrong!